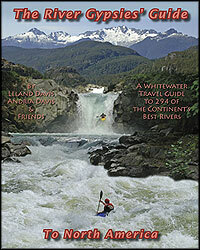 The River Gypsies Guide to North America on sale for only $19.95! This guide to the top 20-40 day runs from class III to V+ in each of 9 highlighted regions across the continent is packed with information helping you to have the perfect paddling road trip - with information on a whopping total of 294 rivers! We've filtered out all of the marginal runs and left enough classic whitewater from each region to keep you occupied for a 1-2 week trip, with detailed info on when the best time is to travel to each region. We've also loaded the book down with info on finding shuttles, camping spots, where to get a shower, internet, or a cold beer. Our hope is that this book will redefine the way that whitewater guidebooks can help paddlers enjoy a region that is not their home area. The River Gypsies' Guide is 408 pages packed with detailed descriptions of 294 rivers, gauge info, scale maps, shuttle directions, and of course, high quality color photos - and lots of 'em. It also has tons of tables to help you compare the difficulty of the streams, nearby camping options, paddling seasons, and other nearby services so that you can plan the paddling trip of your dreams!